DUMBARTON were unable to spoil the flag-raising party when they travelled to play newly promoted Dunfermline Athletic at East End Park. DUMBARTON were unable to spoil the flag-raising party when they travelled to play newly promoted Dunfermline Athletic in front of a 3,496 crowd at East End Park, and lost 4-3. Manager Stevie Aitken fielded three new men in his team for the Ladbrokes Championship match, goalkeeper Alan Martin, on loan defender David Harvie from Aberdeen, and on loan midfielder Joe Thomson from Celtic. 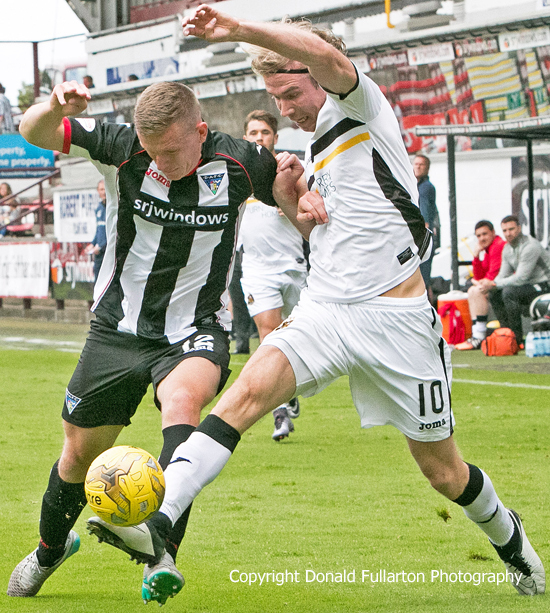 But it was striker Robert Thomson (pictured), one of three former Pars playing for Sons — the others were skipper for the day Gregor Buchanan and Andy Stirling — who caught the eye early on, and he opened the scoring with a close range shot from a Ryan Stevenson free kick. The home side's Michael Moffat hit a penalty off the post after 14 minutes four minutes before Robert Thomson put Sons ahead. But within a further eight minutes the Pars had turned it round with a double by Joe Cardie who then cashed in on a bad defensive mistake by Frazer Wright to make it 3-1 in the second half. Another error at the back, this time by sub Mark Docherty with his first kick of the ball, David Hopkirk made it 4-1 to a home side who could have had more. What turned out a tough afternoon for a very disappointing Sons side had some consolation in injury time when Docherty converted a penalty after Michael Paton fouled David Smith. The deficit was then reduced to one goal when Lee Ashcroft hauled down Robert Thomson and was sent off. Docherty again converted, and shortly afterwards the final whistle blew.